On Friday evening, June 6th, the Rotary Club of West Roxbury-Roslindale hosted its annual Paul Harris awards dinner. This year we were honored to present the award to Mary Mulvey Jacobson. As President of the WRBPA, she works with Deutsches Altenheim and Ethos on the popular "Stand Up For Seniors - Coffee and Conversation with the Candidates" forums so that residents of the German Center and the greater community can hear first hand from candidates running for the public office. She is also a proud and distinguished graduate of Regis College, where she received a BA in Economics, and has served as Class President for many years. Mary is also President of the Irish Social Club of Boston, having taken a leadership role in getting the organization reopened and back on its feet. She is the President of the Board of Directors of Ethos, which provides meals and living assistance to keep Parkway area senior citizens and disabled in their homes for as long as possible. Mary also serves as vice Chair of the West Roxbury YMCA, serving on the Capital Campaign Committee. She was a founding Incorporator of the Gardens at Gethsemane in West Roxbury, a non-sectarian cemetery open to all faiths. She had coordinated the Annual Memorial Day Service for 14 years as well as the First Annual Flag Retirement Ceremony. For over 25 years, Mary served as Co-State Chair of the Massachusetts Beirut Memorial Committee, honoring the Marines who gave their lives in Lebanon in 1983. She worked at Boston City Hall for a dozen years as Chief of Staff to then Boston City Councillor Maura Hennigan and remains active, involved and interested in all things political. She is an elected member of the Ward 19 Democratic Committee. You've heard of us. Now come out to meet us! You're invited to our open meeting next Tuesday, September 11, 2012 at 6pm. We'll be at West on Centre located at 1732 Centre Street, West Roxbury. A presentation of Silpada Designs by Susana Brown is also scheduled. Cocktails will be served. On April 13, 2012, the West Roxbury and Roslindale Rotary Club hosted the Paul Harris Awards at the West Roxbury Elks Club. This year's honorees were long-time Rotarian Alan MacKinnon, Sister Nancy Braceland of Casserly House, and columnist Francis Sullivan. Over 150 people gathered to honor the honorees. The Rotary event also raised money to support its Scholarship Fund and other community programs. Rotary International Assistant Governor Jack Donaldson gave Alan MacKinnon, Sister Nancy Braceland and Francis Sullivan the Rotary's Paul Harris Award for Outstanding Community Service. As signified by the motto Service Above Self, the Rotary's main objective is service in the community, work-place, and throughout. In support of the Rotary Foundation and its initiative on global clean water, the West Roxbury/Roslindale Rotary Club is participating in the Water and Sanitation Rotarian Action Group (WASRAG) program. By following the link: http://www.washforacause.com/westroxburyroslindalerotary/ you can donate $10 to receive a voucher for a free card wash at any of the participating car wash locations. A portion of the proceeds goes directly to the WASRAG program and a portion goes to the West Roxbury/Roslindale Rotary to use in local projects. The West Roxbury/Roslindale Rotary is holding a fundraising raffle. First prize is an all-expense paid trip for two to St. Croix, U.S.
Virgin Islands. This prize includes airfare, hotel, rental car, dinners, tours and more! Additional prizes awarded include Cruzan Gift Baskets. Drawing is Friday, April 13, 2012 at the Paul Harris Awards Dinner. The dinner will be at the B.P.O. Elks Hall at 1 Morrell St, West Roxbury. You need not be present to win. The money raised will go to support the Rotary’s Scholarship Fund and other community programs, upholding the Rotary’s motto of Service Above Self. Prize must be redeemed by December 1, 2012. Alan MacKinnon, CCE President at The Gardens at Gethsemane, had the opportunity to attend the local Rotary meeting in Athens, Greece. The West Roxbury and Roslindale Rotary Club recently hosted the Paul Harris Awards at the West Roxbury Elks Club. This year's honorees were long-time Rotarian and past president Robert Starr and local businessman and community benefactor James Hennigan. Over 150 people gathered to honor the honorees. The Rotary event also raised money to support its Scholarship Fund and other community programs. Rotary International Assistant governor Jack Donaldson gave Robert Starr and James Hennigan the Rotary's Paul Harris Award for Outstanding Community Service. As signified by the motto Service Above Self, the Rotary's main objective is service in the community, work-place, and throughout the world. The Rotary of West Roxbury & Roslindale participated in the 10th Annual Kettle Campaign to raise money for the Salvation Army. Pictured here outside of Roche Bros. are Rotary President Terry Rezendes and Vice President Trisha Resevic. Donny Delpha is making a contribution. The object of Rotary is to encourage and foster the ideal of service as a basis of worth enterprise and to encourage and foster high ethical standards in business and professions. On May 14th, 2014, the annual Jason Roberts Challenger League charity softball game between the Rotary Club of West Roxbury-Roslindale and the Kiwanis Club of Roslindale-West Roxbury took place at the Ohrenberger Community Center. The event was a huge success, capped off by a 16-13 win by the Rotarians. Refreshments were served to all who participated, courtesy of Alan MacKinnon from The Gardens of Gethsemane. All proceeds from the event went to the continued support of the Jason Roberts Challenger League. On Friday, June 27th, 2014, the Rotary Club of West Roxbury-Roslindale held an installation dinner for incoming President Terry Curran-Rezendes at the Sons of Italy Lodge in Roslindale Square. Terry is a two-time past President of the club and proceeds from the evening were donated to the Rotary Foundation in Terry's name. On January 31, 2015 two of our Rotarians will be participating in the annual Polar Plunge for Polio at Long Beach in Gloucester. Rotary, the World Health Organization, Unicef, United Nations Charitable Trust, the Bill and Melinda Gates Foundation, and United Nations Foundation are on a quest to rid the world of Polio by the year 2018. Each dollar raised by this event provides 5 vaccinations to help children be protected from this horrible, debilitating disease. Last year, plungers from Rotary District 7930 raised over $100,000 and provided the funding to protect over 500,000 children in some of the poorest areas in the world. This year, we have committed to $125,000, which will provide more than 625,000 more vaccines. 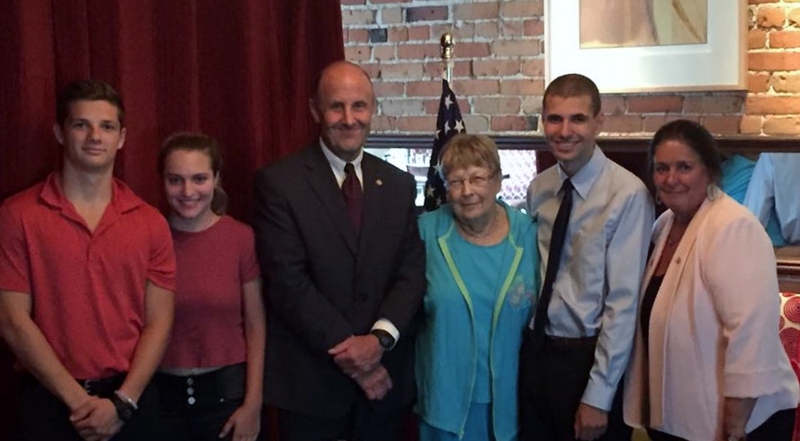 On August 13th, 2013 the Rotary Club of West Roxbury-Roslindale awarded its annual scholarship to four outstanding students from the local community (listed below in alphabetical order). Sean Canty, Jr. is a graduate of Catholic Memorial and will be attending St. Anslem's College with his expected field of study in business and political science. Angel Jin is a graduate of Boston Latin School and will be attending Harvard University with a field of study in economics with computer science. Andew Patton is a graduate of Learning Prep High School and will be attending UMass, Boston with a field of study in business management. Caitlin Walsh is a graduate of Fontbonne Academy and will be attending UMass, Dartmouth with a field of study in music and music business. Hello Friends of the West Roxbury and Roslindale Rotary! helped us raised these funds and now we'd like your help spending it! enrolled in a school of higher learning next year. For a chance costing only $20 you can win an all-expense paid trip for two to St. Croix in the U.S. Virgin Islands. Prize includes 7 nights hotel, car rental, round-trip airfare, several dinners, an Island Tour, a water tour and more. Tickets will be on sale until April 13th when the winner will be drawn at the Paul Harris Awards Dinner. This years recipients are Sr. Nancy Braceland of Casserly House, Rotarian Alan MacKinnon of the Gardens at Gethsemane and Francis X. Sullivan founder of the P.I.N.C.H. Foundation. The dinner and drawing will take place at the West Roxbury Elks Hall, 1 Morrell Street, West Roxbury at 6:00 p.m. Tickets for the dinner are $25. Chances for the Drawing and Tickets for the dinner are available from any Rotarian or at the following businesses: The Cooperative Bank (Roslindale and West Roxbury branches), Brookline Bank, Parkway Printing, Mt. Washington Bank, LaRosa Real Estate, West Roxbury YMCA, Peoples Savings Bank and Travel by Judie Leon. The West Roxbury/Roslindale Rotary Club in conjunction with Rotary clubs worldwide are mobilizing resources to deliver urgently needed relief and ShelterBoxes to the millions affected by Haiti's devastating earthquake. ShelterBox is an ongoing project of Rotary International and has already delivered more than 3,300 containers to Haiti, with another 1,000 or more scheduled to be deployed. Each box contains a tent that houses 10 people as well as a stove, water purification equipment, and other essential items. Doctors have been using supplies from the containers to treat the injured. Hospitals in the capital city are using the tents to provide emergency shelter for postoperative patients. The price of a complete Shelter Box is $1,000 (US), and the club is matching donations up to a maximum of $1000. Any and all donations are also gratefully accepted and will be forwarded for Haitian relief. On Saturday, September 26th the West Roxbury-Roslindale Rotary and the West Roxbury/Roslindale Kiwanis clubs joined together in a fundraising effort for the Jason Roberts Challenger league by participating in a Home Run Derby and Softball Game with all proceeds donated to the League. Participants of the League played an inning or two assisted by Rotarians, Kiwanians, family and friends in the field. Please check the photo gallery for more pictures of the day. More than 100 friends, family and elected officials came together on April 24, to honor Suffolk County District Attorney Dan Conley as he received the Rotary Club International Paul Harris Award. Named after the founder of Rotary International, the Paul Harris Award is one of the highest awards in Rotary and is offered to individuals who have made selfless contributions to the community. Some accomplishments as district attorney include anti-gang legislation, an overhaul of the way police and prosecutors gather and use evidence, and opening Massachusetts' first Family Justice Center. Conley has increased prosecution of financial theft cases and computer-related crimes. In addition to friends and Conley's family, as well as many elected officials showing support. Guests included City Councilor John Tobin, (who was installed into the West Roxbury~Roslindale Rotary Club as well), City Councilor Rob Consalvo, State Rep. Mike Rush (who also agreed to Join the West Roxbury ~ Roslindale Rotary), Boston City Councilor at-Large Andrew Kenneally, mayoral candidate Michael Flaherty, and Rotary District Governor Thomas Elliot. On Saturday, May 16, Rotarians from the West Roxbury-Roslindale Rotary gathered at St. John Chrysostom Church to hold a Pancake Breakfast. Students from Fontbonne Academy, Boston Latin Academy and Trinity Academy dressed as "Disney" Characters and greeted and visited young and old patrons alike. Students from the Mozart School's "Making Music Matters" program, performed at 10:00am to the delight of all present. Proceeds from the days activities support the Rotary Scholarship Fund. See Photo Journal for more pictures of the days activities. On February 24th, Mayor Thomas Menino joined members of the West Roxbury/Roslindale Rotary at the W.A. Mozart School, 236 Beech Street, Roslindale to hand out dictionaries donated to third grade students throughout the neighborhood. See Photo Journals for more pictures. Mayor Thomas Menino joins West Roxbury/Roslindale Rotary Members at the Kick Off of the Dictionary Project at the Ohrenberger School in West Roxbury.